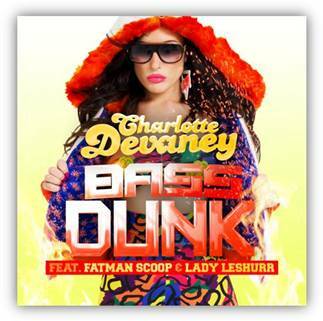 Coming off the back of Flip It with Snoop Dogg, DJ extraordinaire Charlotte Devaney unveils her brand new club banger featuring US star Fatman Scoop and UK leading female rapper, Lady Leshurr! The trio have come together to create a dance floor filling summer banger, that’s certainly guaranteed to get the crowd jumping! With Charlotte’s signature catchy synth weaved into the warm baseline, as well as the sharp crisp sax sounds, Bass Dunk is a track you will be singing along to after first listen. Charlotte ethic is to always bring something different, fun and lighthearted into everything she does and the Bass Dunk video is definitely that! It was co-directed and produced by Charlotte and features Fatman Scoop in some hilarious scenes, Lady Leshurr joining in the fun and cameos from dance music legends Fabio & Grooverider and rapper Young O.
Remixes from The Wideboys, Scottie B, I Said No and DJ Q which had first play by Toddla T at Glastonbury on Radio 1, plus early support from EZ , Diplo & friends, Adele Roberts, Ray Foxx, Majestic, Wideboys ,Roska and Marcus Shultz.